Honey is also known as "Golden liquid" but an excellent alternate of white sugar. Honey is an excellent source of natural sugars like fructose and glucose. The glucose in honey is absorbed by the body quickly and gives an instant energy boost, while the fructose is absorbed more slowly and acts as sustained energy source. Honey is often recommended to athletes to enhance their performance, and endurance. Natural sugars in honey also prevent and reduces muscle fatigue during workout. Honey contain many essential vitamins, minerals and antioxidants. Anti-fungal and anti-bacterial properties of honey are very beneficial to prevent many ailments. By making honey an essential part of your daily diet, is one of the simplest yet most effective ways to prevent various infections and diseases. Honey contains several ingredients which make it an excellent component of various beauty products. Due to its immense importance in health, fitness and beauty products, it is often recommended by many medical doctors, naturopaths, nutritionists, and dietitians. Let's have a look on some health and beauty benefits of Honey. Honey contains a good amount of flavonoids and antioxidants which help reduce the risk of heart attacks and many other fatal heart problems. Honey mixed with cinnamon has been shown to revitalize the arteries and veins of the heart and reduce cholesterol in the blood by up to 10%. When taken on a regular basis, this honey-cinnamon mixture may reduce the risk of heart attacks and stop another from occurring in people who have already suffered one. To prevent heart problems you can add 1 tablespoons of honey and 1/3 teaspoon of cinnamon to lukewarm warm water and drink it daily. Taken on a regular basis, this concoction helps reduce the risk of heart attacks. Honey is an excellent way to naturally reduce the level of bad cholesterol, which narrow arteries, block blood vessels and can lead to heart attacks. According to recent searches, taking honey every day helped improved levels of antioxidants in the blood, which can keep bad cholesterol from oxidation. International Journal of Food Sciences and Nutrition, published in 2009 states that honey promotes healthy heart by improving blood circulation and preventing clogging of arteries. This is possible because honey reduces the level of bad cholesterol (LDL) and increases the level of good cholesterol (HDL) in blood. It helps in removal of cholesterol from the walls of blood vessels and prevents build-up of a plaque. Honey is also very beneficial for eyes. Besides improving eyesight honey can be used to cure many eye diseases. Honey is also very helpful in the treatment of eye infection such as redness and itching of the eyes, trachoma, conjunctivitis and other similar diseases. Honey is also very useful for prevention of cataract. Problem of Dry Eye Syndrome can be cured by using honey. Dry eye syndrome is the result of drying out of liquid in the white or conjunctiva part of the eyes. You can cure this problem by mixing 1 teaspoon of honey in warm water. When this solution becomes cool down then use this solution to wash your eyes. This solution also works as an excellent eye wash for relieving eye infection. Honey has excellent antibacterial properties and good amount of antioxidant which helps a lot to improve your immune system. Honey also helps in keeping away several infectious diseases like flu, common cold, etc. To improve your immune system, add 1 tablespoons of honey, 1 lemon juice to lukewarm water, mix them well and and take it daily on an empty stomach. The antioxidants in honey not only improve immune but also suppress coughs and relieve throat pain. The darker the honey, the more antioxidants it contains. To cure cough and cold you can mix half teaspoon of honey to hot tea, or mix a teaspoon of honey with either equal parts ginger or half a teaspoon of cinnamon. For best results drink this two or three times daily. Honey has antibacterial properties that make it useful for healing cuts. An enzyme in honey produces hydrogen peroxide, which can disinfect the wound and prevent bacteria from growing in it. Honey's thick consistency also deters infection, and when applied to a cut it creates a moisturizing barrier that protects the afflicted area. Besides this, honey can also stimulate production of new capillaries and tissues and thus boosts the process of healing wounds. You can apply a dab of honey to the cut or wounded area and cover with a bandage. For best results replace daily with fresh honey and bandage. Honey is also beneficial in curing the problems of digestion. For those who suffer from indigestion, the antiseptic properties of honey relieve acidity in the stomach and improve the process of digestion. Honey also neutralizes gas, becoming the ultimate stomach soother when it comes to overeating. Honey is also used for treating ulcers, constipation, nausea, etc. Drinking tea with honey provides relief from digestive disorders. May be its quite surprising for you but its true about honey, that it is really helps weight loss. Though honey has more calories than sugar, when honey is consumed with lukewarm water, it helps in digesting the fat stored in your body. To enhance the process of weight loss you can also add some lemon juice along with honey and mix them well in lukewarm water. It is an excellent way to cleanse liver, remove toxins and flush out fat from the body. For best results drink this mixture on an empty stomach. Recent scientific researches have proved that honey also helps a lot in boosting your memory. The simplest way to consume honey is to take 1 teaspoon of honey in the morning, half an hour before breakfast, or just before going to bed. Regular consumption of honey on daily basis will give you excellent result within few days. Honey is also helpful in controlling blood sugar level. It is a great source of natural sugars like glucose, fructose and minerals along with essential vitamins and minerals like copper, iodine and zinc in small quantities. Its exact combination of fructose and glucose actually helps the body regulate blood sugar levels. You can replace the common white sugar with honey as it is considered a safe alternative to white sugar for diabetics but still avoid over consumption of honey and try eat it in moderation. Even though honey contains simple sugars, it is not the same as white sugar or artificial sweeteners. Since the level/type of diabetes varies from one person to another, it is advisable to seek your doctor’s advice prior to consumption of honey to safely use it as an alternative. Honey helps a lot to get fair and glowing skin. You can use the honey with some other natural ingredients and can get fair glowing skin even at home. (i) Mix some papaya pulp with honey to make a skin whitening mask. Apply this mask on your face daily at least for 20 minutes. This mask will make your skin fair and glowing. (ii) Take 1 tablespoon of honey and mix with 1 tablespoon of lemon juice and apply this mixture to your face and neck. Wash off after 15 minutes. A mixture of onion juice and honey is also very helpful in getting rid of premature wrinkles. Mix 1 tablespoon of Onion juice with honey and apply this mixture to the affected areas. Leave at least for 15 minutes and then rinse off. Honey and egg white mask is also very helpful to get a youthful and tight skin. Apply one spoon of honey mixed with one egg white on your face to tighten your skin. Use this remedy twice per week and see the difference within few days. Honey is also very helpful to get rid of tanning due to sun exposure. Mix equal quantities of honey, milk powder, lemon juice and almond oil and apply it on your face, neck, hands, etc. Keep it at least for 20 minutes and then wash it off with fresh water. Take 1 teaspoon of honey, 1 teaspoon of fuller's earth(multani mitti) and 1 egg yolk. Mix all the ingredients and apply this mixture to your face at least for 15 minutes. Finally wash off with lukewarm water. This face mask not only remove excess oil but also give your healthy and glowing skin. To get rid of pimples, make a paste of honey and cinnamon powder and dab it on the pimple. Let it stay at least for half an hour and then rinse off with lukewarm water. Regular application will give you an excellent result within few days. Skin exfoliation at least once per week is essential to remove dirt, impurities and get rid of dead skin cells. Honey can be used to exfoliate skin as well. Mix a small amount of honey with an equal part organic raw sugar and few drops of lemon juice. Rub this mixture gently over wet face and neck in a circular motion then rinse off with lukewarm water. Honey is an excellent natural conditioner for your hair. According to your hair length, mix honey with some olive oil and apply this mix on your well-shampooed hair. Leave this at least for half an hour and then rinse off. You will get healthy, shiny and silky even after first experience. 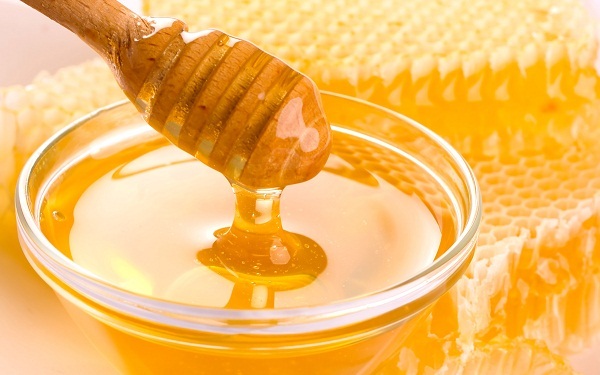 Honey is also very helpful to cure the problem of itchy scalp and dandruff. After regular hair wash, rinse your hair with a diluted mixture of 1 tablespoon of honey and 1 cup of lukewarm water. Leave this at least for one hour and then wash off. To get rid of unwanted facial hair take one teaspoon of honey, one tablespoon of sugar and a few drops of lemon juice. Mix all the ingredients to make a smooth paste and now heat this mixture in a microwave for up to three minutes. Touch to see if it isn’t too hot and then apply this on the area you want to pluck hair from in the same direction as the hair growth. Use muslin or cotton strips to absorb the wax. Press them down firmly and then pull off in the opposite direction of hair growth. Besides facial hair removal, you can also use this method to remove unwanted hair from arms and legs as well.